Vulvar pruritus is a common symptom, which, if protracted, causes significant distress. Rapid resolution hinges on an accurate diagnosis. This chapter will outline a pragmatic clinical approach to a patient with pruritus, leading to an accurate assessment, thereby allowing effective, adequate treatment. It will briefly cover the pathophysiology of pruritus and the main differential diagnoses, with clear clinical pointers to diagnosis, ending with general along with specific treatment options. ACOG Practice Bulletin No. 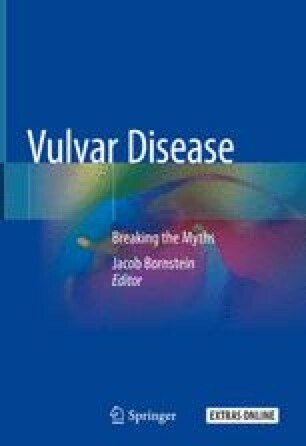 93: diagnosis and management of vulvar skin disorders. Obstet Gynecol. 2008;111:1243–53. https://doi.org/10.1097/AOG.0b013e31817578ba. NICE. Pruritus vulvae—NICE CKS. 2016. http://cks.nice.org.uk/pruritus-vulvae. Accessed 27 Oct 2016.